This week I've got lots of holiday sewing to share. I just made a quilt that I can't share, which always bums me out, but I've been spending some time making some small holiday projects. that I CAN show off! I have some really amazing friends who live scattered around the country. We really enjoy sending each other care packages throughout the year. I've recently fallen down on the job of just sending little cards and gifts. One of my friends, Kadi, just sent me this fantastic Halloween package that had candy, a Starbucks gift card, festive socks, Target coups, and some other little things. It was just so thoughtful and full of things that are absolutely me. So my first order of business was a return package for her! I had a Basic Grey charm pack [I cannot for the life of me remember the fabric line] from last year laying around. 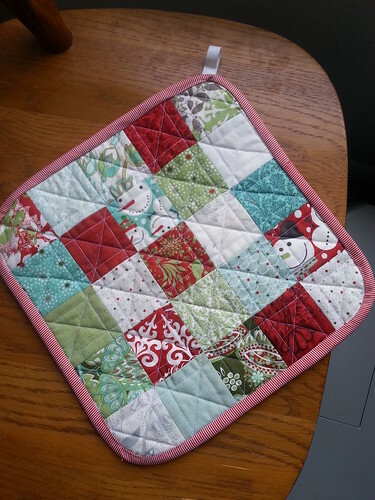 I cut it up into 2.5" squares and sewed 25 together into a hot pad. 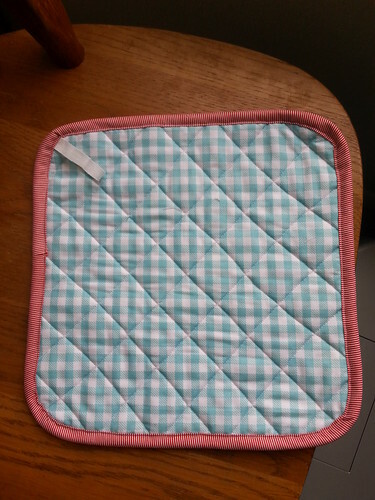 I normally make them with Insul-Brite, but I didn't have any, so I quilted the top onto a layer of batting, and then quilted the entire thing to another layer of batting and the backing fabric. I rounded the corners and added some red pinstriped binding. The loop is a piece of the selvage! ...and load a basket full of goodies. 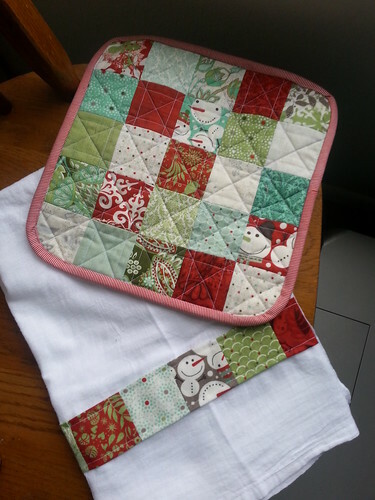 Stay tuned for some upcoming posts of holiday pillows, advent calendars, and handmade Christmas presents! 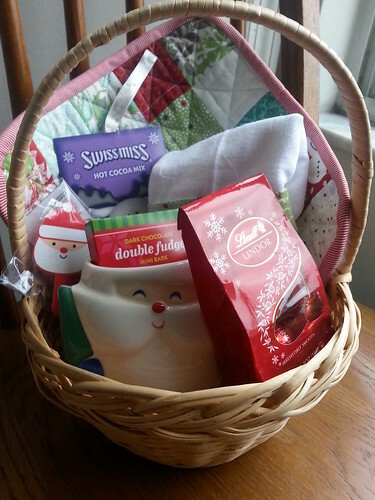 A fabulous gift basket. It should bring a smile to her face and a tear to her eye. Love the pot holder!